Every event deserves a venue as special as the occasion. Whether a wedding, a corporate cocktail party to signal a success or a joyful celebration that brings family and friends together, The Ringling offers a variety of spectacular venues that promise to mark your occasion as unforgettable. Please call to book a tour with our experienced events staff. Enjoy various corporate and private events at The Ringling: annual office parties, retirement parties, holiday parties, birthdays and more. Plan your event at The Ringling today. Sarasota's favorite for weddings and receptions, The Ringling offers a spectacular array of venues. Your wedding at The Ringling will create memories to last a lifetime. Whether in Mable's Rose Garden, the Museum of Art Loggia or in the peaceful shade of the banyan trees, The Ringling provides the perfect setting for your wedding ceremony. 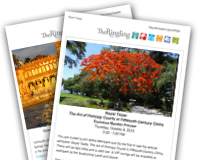 Thank you for considering The Ringling for your upcoming event. Our professional staff is happy to answer any questions you may have. Reserve your date at The Ringling today!